You are here: Home / Articles / Food & Health News / When life gives you lemons, Rejoice! When life gives you lemons, Rejoice! Winter foods may seem boring until we add this colorful, flavorful little gem. Let me share with you a few of the lemon’s health benefits and some of my favorite ways to add it to your diet during these dreary winter days. Lemons are high in vitamin C. Most people know this … but by adding it to certain foods, it helps absorb other important nutrients, such as iron or calcium. 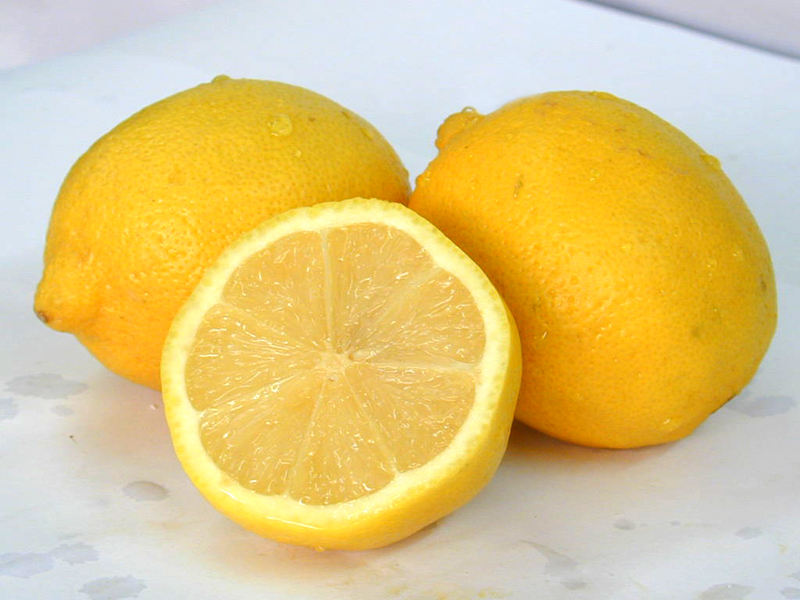 One little lemon has about 140% of the RDA for vitamin C.
Lemons can help you lose weight. Really? Yes! I recommend them to all who do my “two week challenge” and any type of weight loss or detoxifying diet. Hot water with lemon is liver-friendly, and “cleansing” the liver is a key component of weight management. Lemons have cancer-preventive compounds in the peel. These phytochemicals (beneficial plant compounds) may also help lower cholesterol. Organic versus conventional? If I am using the zest or adding the whole lemon to a dish, I buy organic since conventional lemons are both sprayed with pesticides (harmful chemicals in our bodies) and typically waxed. In this case, while the price may be cheaper, the flavor is as well! Chemicals in the zest are really not desired. Go organic. Otherwise for juicing the lemons, just wash them well before using. Green tea with lemon — it’s truly a smart thing to do for your health with all the tea and lemon phytochemicals. O.J. — I cut up lemons and add them to my morning o.j. (preferably freshly squeezed.) Add seltzer and lemons or limes and drink that any time of day. Hot water with lemons and honey — even if you’re not a singer, this is good for you and maybe will improve your singing voice? Pancakes, muffins, waffles or scones — add some zest to any batter. Yogurt — squeeze lemon juice into your yogurt and add chopped fresh fruit and granola for a vitamin blast to start your day. Papaya — (my favorite) — sure it’s exotic but it’s also available. It’s soooo good simply peeled and cut up (remove the black seeds) with lemon squeezed on it. Boost up yogurt by adding this combo to plain yogurt and drizzle with honey or agave syrup. Goat cheese — zest a little lemon and squeeze the juice into a small amount of goat cheese. Add a dash of salt and any herbs or garlic too. Smear on some Triscuits, flatbread crackers or toasted whole wheat pita. Top with some sliced grape or other tomatoes and feel good about this healthy snack! Guacamole — At a minimum, mash 1 avocado with the juice of 1 lemon (or lime) and salt. Smear it on toast, pita, bagel, a tomato or a piece of lettuce. Just eat it, often! The options are endless … sometimes we just need a reminder. If lemons are in your kitchen, use them! Lemons are great on just about any poultry, pork, or fish — baked chicken, poached fish, steamed lobster or fried shrimp — lemons enhance them all. Sautéed or steamed vegetables. Even mashed sweet potatoes taste better with some lemon juice! Legumes love lemons. Lentil soup and bean salads (black bean or white cannellini in particular) are great with fresh lemon juice and zest. Seafood or even a simple corn chowder begs for fresh lemon as well. I’m rejoicing because life is sooo much better thanks to all the lemons. Happy New Year, happy winter fruit and here’s to your health!